vegan world! the newest los angeles vegan restaurant! 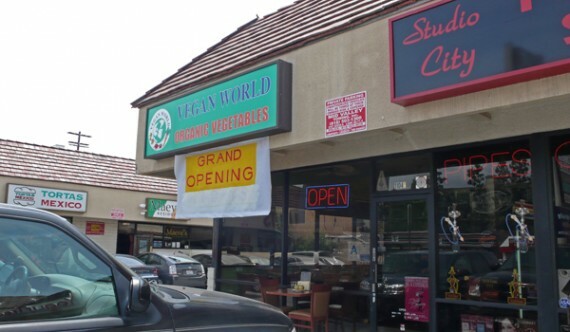 it is with great excitement that i inform you…los angeles has a brand new vegan restaurant called vegan world, located at ventura and vineland in studio city. this weekend marked their grand opening, and naturally we were there to suss it out. in true unmatched valley class, the restaurant was sandwiched between a beauty shop and a fast food place, all within a very respectable strip mall. naturally, we arrived at the restaurant starving…and craving a unique meal that would send us into blogger-eater-paradise. however, one look at vegan world’s menu and it’s limited options of tahini wraps, salty noodles and cowboy burgers told us that this restaurant just wasn’t our style….vegan world turned out to be just another vegan thai place. zzz.